This very affordable American Country home boasts an extremely efficient floor plan that maximizes the compact square footage. An elegant columned porch with gorgeous arched windows greets visitors and welcomes you home every day. 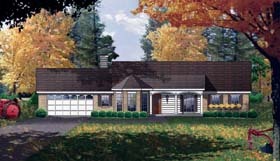 The front entry opens directly into the large Family room, where you will enjoy years of memories in the making. The Kitchen features a convenient raised bar, and access to the bayed dining room that is flooded with natural light by three tall windows. All of these features will make serving the family meals easy and enjoyable. The Master Suite has ample natural light, two walk in closets and a cozy bath room. Two additional bedrooms are served by a split bath and feature ample closet space.